As I write, Hurricane Sandy is making its way through New Jersey and New York wreaking havoc. Some of the press is claiming this “Frankenstorm” is a result of global warming. Some proponents of anthropogenic global warming (AGW) claim that hurricanes will become either more frequent or more intense as the planet warms. Let’s look at some real data from Dr. Ryan Maue (http://policlimate.com/tropical/ ). Next, we drop down the energy scale a bit to include tropical storms and see that they, as well as hurricanes are not becoming more frequent. 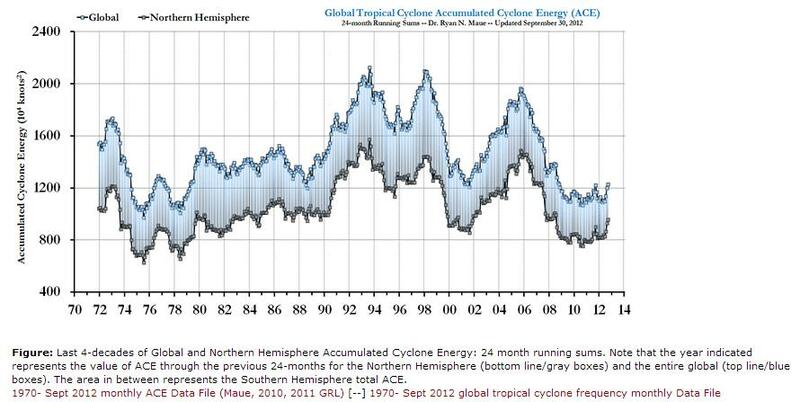 From these data we see that hurricanes fail to follow the AGW predictions. So, either AGW alarmists are wrong or there is no recent global warming. Is Sandy unprecedented? No, but it is unusually strong and widespread because of the confluence of a hurricane with a major cold front from the north. Sandy made landfall in New Jersey, so look at the history of such hurricanes from “Hurricanes and the Middle Atlantic States.” That source provides brief descriptions of 21 hurricanes that affected New Jersey between 1821 and 2011. That list includes Hurricane Hazel on October 15, 1954. So even October hurricanes are not unprecedented. Although the science of exact attribution is not settled, it does seem that AGW is not the answer since natural variability provides an explanation. If you can’t see the hockey stick in the third graph, then you are just willingly blind. Right, there are many little hockey sticks pointing in all directions. I presume that Ward was being sarcastic. I prolly should have said a whole ice rink full of hockey sticks. 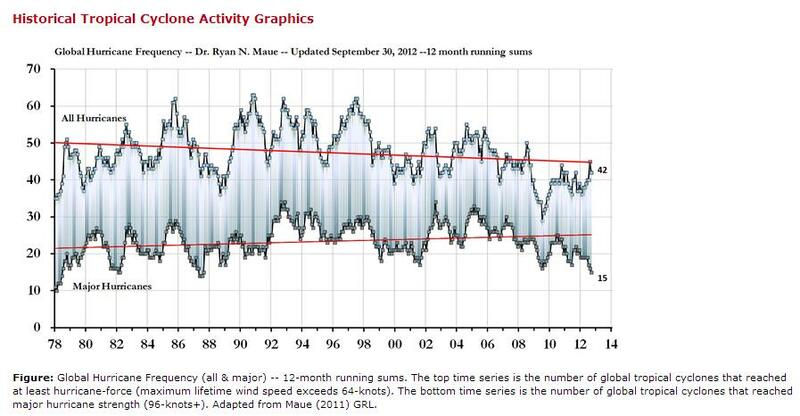 I believe I do see the hockey stick in the third graph(the ACE graph) and it appears to be at near record lows for the last three or so years. This could mean it may next be trending upward, but so what? It looks like it has gone through similar vicissitudes over the last(rather recent) 40 years. I don’t pretend to be proficient at graph analysis, or probability either, but it would be my layman’s guess that before one can draw any reasonable conclusion or trends from this graph, a whole lot more data(in years) needs to be included. I prolly should have said a whole ice rink full of hockey sticks. Like after an NHL fight. This issue was discussed last night on PBS. For the first time that climate was discussed, two viewpoints were invited. The lead in piece shows alarmist bias, but the question is fairly raised. Joe Romm argues for mitigation, of course, and Kenneth Green of AEI argues for adaptation.